One of the biggest challenges I’ve faced in learning to read Thai hasn’t been the consonants, vowels or many rules, it’s the ever changing look of the consonants in every day signage. There is nothing more frustrating than knowing the Thai consonants and vowels only to have them change on you from sign to sign. I love leaving my Thai Language class pumped up because I have put together a few more pieces of the Thai language puzzle and I’m ready to take on as many signs as I can on the walk home. Most signage uses the traditional Garuda font which people learning Thai are used to seeing, but then there are the multitude of other fonts. Looking closely at these other fonts it seems that many of the Thai consonants change completely and some seemingly into English or Russian. It often makes learning to read Thai a little more difficult until you get accustomed to the different styles of fonts used. So today I put together a PDF file containing the most often used Thai fonts that you will see in your travels around Thailand. The PDF contains all the Thai consonants in 25 different fonts that will hopefully help you to easily remember the looks of the consonants in the different font styles. Hi Talin, I’ve had the exact same problem and I did what you did – I got a print out with all the different fonts. I can make sense of most fonts these days, but I still get stumped when they get too fancy. Talen, having a printout of Thai fonts is a good idea. I still have problems reading some of the more modern fonts so generally blow it off. Btw – for the computer, I use Thonburi because if you are using Thai and English in the same sentence, most fonts have the Thai very tiny. With Thonburi, both are legible. 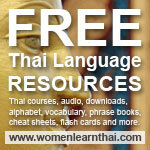 Ao to avoid eyestrain, you are not having to edit each and every instance of Thai. Cat, that is excellent advice on using the Thonburi font. I’m going to upload it to my fonts now. Agggg. Just get me to Thai reading and writing class. I don’t even want to think about those pesky fonts yet! By the by, I like your new photo for your site. Backyard pic? I have a bunch of different header pics I rotate around occasionally …this one was taken at Nong Nooch Tropical Gardens…Wish I had a backyard that nice though. Yeah, I’m not even starting to learn to read Thai yet, and I’ve noticed that the fonts are all crazy and different. It reminds me of teaching kids how to read English–one small change in the way a letter is written would totally throw them off. I understood why before, but now I *really* understand! Talen, thanks for the PDF. I must look like I have some type of disorder as I sit staring at signs, silently trying to mouth words, in public. I find the function on Thai–English English–Thai Talking Dictionary by Benjawan Poomsan Becker and Chris Pirazzi, really helpful for decoding some of those insane fonts.